Sligo Grammar School is a private fee paying co-educational boarding school located on The Mall in Sligo. The school has approximately 449 students of which approximately 103 are boarders. It offers the traditional Junior Certificate and Leaving Certificate courses along with Transition Year, which is compulsory. It is one of a small few of Secondary Schools in the Republic of Ireland under Church of Ireland management. The school has a large amount of international pupils, primarily from Spain, Germany and South Korea, though there are also pupils from Russia and Ukraine as well as a number of other nations. The school has existed in various forms for over 400 years, its constitutions reflecting the changing outlook and needs for society. The present school incorporates part of the Charter School which was set up in 1752 under the Royal Charter. This school closed in 1843. The Diocesan School In Elphin, which numbered Oliver Goldsmith among its pupils, was moved to Charter School buildings in Sligo in 1862. In 1907, the school buildings were conveyed to the Incorporated Society who closed their boarding school at Primrose Grange under Knocknarea and built spacious dormitories and classrooms (the present boy’s dormitories and "Prep Room") on the present site, of Sligo Grammar School. In 1947 Sligo Grammar School was merged with Sligo High School which was founded by Dean Ardill in 1911. The premises of the High School were closed and the residence known as the "Hermitage", adjoining the Grammar School, was purchased from the Campbell family to house the girl boarders. The New Teaching Block was added in 1971, and expanded in 1985 and 2002. In August 1976, the school was leased by the Incorporated Society to Sligo Grammar School Limited, which runs the school through a local Protestant board. "The Hermitage" was destroyed by fire in November 1976 and was replaced by a new residence in September 1978. An extension to the school including more classrooms and a new library was completed in September 2012. A new rugby pitch (to replace the old 'Donkey pitch') and slip for kayaking are to be finished by September 2013. A new wall and gate has recently been completed on the entrance to the school. School tie consisting of maroon, navy and white stripes. The school rugby kit is made up of the school colours. The differentiator between senior and junior sides is the inclusion of the colour red in the socks for seniors players. 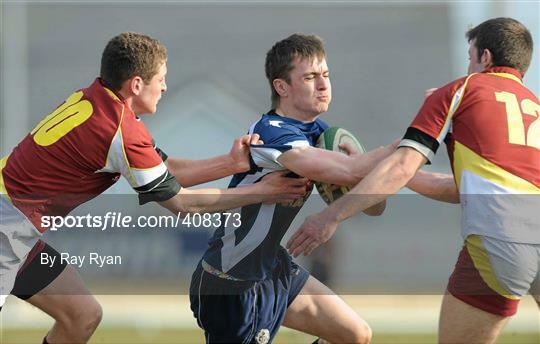 Sligo Grammar School were Senior Connacht Rugby Champions in 2014 for the 10th time. Their most triumphant senior cup campaign was led by captain and vice captain Tom Callaghan (open side flanker) and Oskar Van der Grijn (scrum half) in 2010 where they went the entire season unbeaten. The 2010 cup team defeated Blackrock College, Clongowes and Campbell college on their way to lifting their first senior cup in 15 years. Gary McConnell who was capped as an Irish Schools International during the 2010 campaign was renowned for his ability to bounce opponents a minimum of 3 feet per collision. He was a fundamental factor to their success.The school also has a very active athletics association and many hockey teams for girls. Competitive debating teams in English, Irish and German also exist. The school has an SATB choir with approximately 70 members which is quite well known around Sligo and they have released two CDs. Oliver Goldsmith was a student of Elphin Diocesan School, which later became part of the Grammar School.